Developed to meet your pets specific needs with the appropriate vitamin, protein and fibre balance. High in Vitamin E and Selenium. Suitable for pets, as well as show and breeding stock to maintain excellent health and top condition. Our most popular mix. For pet, show and breeding animals. Contains Milne and Thompson & Redwood rabbit and guinea pig pellets, Hygain Prodigy pellets with superior vitamin and mineral content, lucerne chaff, oaten chaff, wheaten chaff, flaked lupins, steamed flaked barley, and rolled oats. For active or underweight rabbits and guinea pigs. 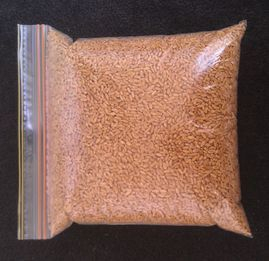 It can also reduce wastage for those very fussy eaters who refuse the chaff - however for these fuss-pots, its important to limit the quantity of feed offered (approx 25-30grams per kg of bodyweight, dependent on activity levels) and to ensure adequate hay is consumed to maintain digestive and dental health. 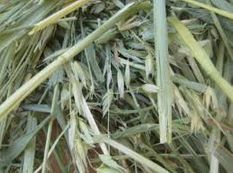 This mix has higher protein and a little less fibre; which is achieved by reducing the quantity of chaff and increasing the amount of pellets and flaked lupins. It contains Milne and Thompson & Redwood rabbit and guinea pig pellets, Hygain Prodigy pellets with superior vitamin and mineral content, flaked lupins, steamed flaked barley, rolled oats, lucerne chaff, oaten and wheaten chaff. Higher fibre, reduced protein and calories to support gradual weight loss. For less active, overweight or older rabbits and guinea pigs. This mix can also support dental health and the sensitive digestive system. 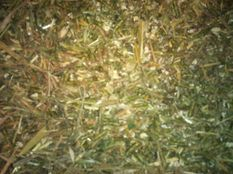 This mix is a high fibre, lower protein feed; which is achieved by increasing the quantity of chaff and limiting the amount of pellets. All the taste and nutrition with added health benefits. It contains primarily lucerne, oaten and wheaten chaff, with Milne and Thompson & Redwood rabbit and guinea pig pellets, Hygain Prodigy pellets with superior vitamin and mineral content, steamed flaked barley, flaked lupins, and rolled oats. For the sensitive digestive system. Contains lucerne chaff, oaten chaff, wheat chaff, flaked lupins, steamed flaked barley and rolled oats, for rabbits who can't tolerate pellets or are prone to diarrhoea. Already feeding Unusual Pet Vets Mix? Are you already feeding Unusual Pet Vets Premium Rabbit & Guinea Pig Mix? We replicate this popular mix, using the same ingredients but at a discounted price. Save up to $7 off UPV prices, conveniently packaged in a resealable ziplock bag. NEED A CUSTOM FEED MIX? Spoil your bunny with a treat that is natural, healthy and nutritious! Many commercial treats are high in sugars, and similar products on the market use flour, molasses and egg products to keep product shape - ever known egg as part of a rabbit's natural diet?! Starchy, high sugar diets can cause obesity and digestive disruption including overproduction of cecotropes and diarrheoa. Better still, our prices are cheaper than the majority of pet stores. These great tasting cubes are all natural, made from pure compressed quality alfalfa. Can be served as a special treat or part of the regular daily diet. 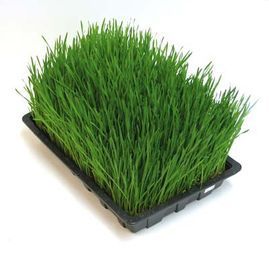 Grow your own wheatgrass, and always have a fresh, delicious and nutrititious treat available for your furry friends! Wheatgrass is an excellent source of potassium, fibre, Vitamins A, C, K, and B6, Thiamin, Riboflavin, Niacin, Iron, Zinc, Copper, and Manganese. Its easily digested and suitable for most critters, even for sensitive bellies. 1. Line a shallow tray with a thin layer of soil or cotton wool. 2. Sprinkle with seeds and give an initial watering, ensuring the base is damp but not wet. 3. Keep damp, especially in the first few days as the seeds germinate - I use a mist spray. 4. Seeds will grow and are ready for consumption within 7-14 days. 1. Throw a handful onto the garden where you want the seeds to grow - No need to cover with soil. 3. Seeds will grow and are ready for consumption within 7-14 days.